I am kind of a brownie snob. They are pretty much my favorite food (don’t judge) and I have been making them for lots of years. I have perfected my regular brownie recipe and thought I should challenge myself to come up with a recipe for a fudgy brownie without using butter. I did it!! The chocolate chips on top are optional, but, um, why would you leave them out? Life is better with more chocolate, am I right? Now, when you are baking these and the timer goes off you are going to think they are not done. You can’t really use a tester because they will still look too gooey, but they continue to cook in the pan after you remove them from the oven. We want them fudgy, so go ahead and listen to me and pull them out at 20 minutes. Everyone’s ovens are a bit different but that was the sweet spot for me! 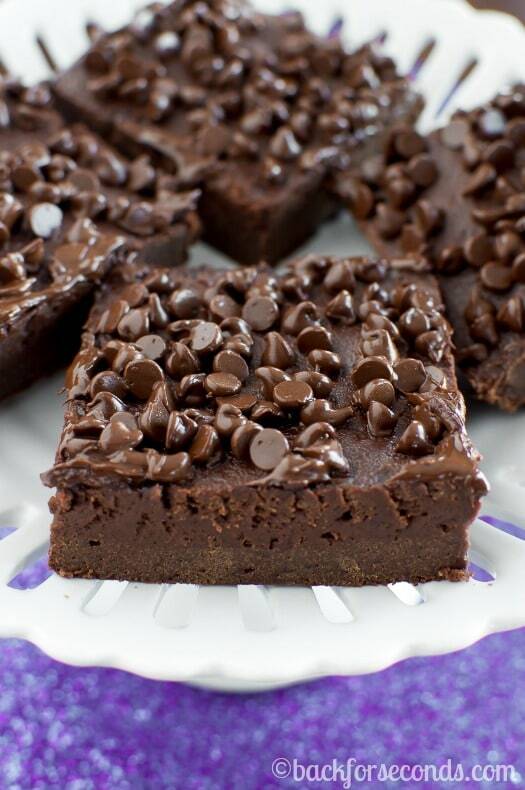 These are dense and chocolatey and a lovely alternative to the full fat brownies. Enjoy! My 3 year old son and I just made these for a rainy day treat and I have to say, we’re in love! I used a cherry greek style yogurt and the chocolate offsets perfectly! Thanks so much! I love this recipe, I have used it 4 times! Delish! Better tasting than the unhealthy ones! I just finished making these. I couldn’t find my 8×8 pan so I made them in an 8×6 and I took them out too early 🙁 I only left them in for 25 minutes and should’ve done at least 30 minutes. The flavor is really good and i like the texture. Very satisfying! You could use canola oil or vegetable oil instead 🙂 Enjoy! These look delightful ! I was wondering if anybody knows if I could use Stevia instead of the sugar in these brownies ? I made these yesterday, and I have to say that I was amazed!! They turned out great! 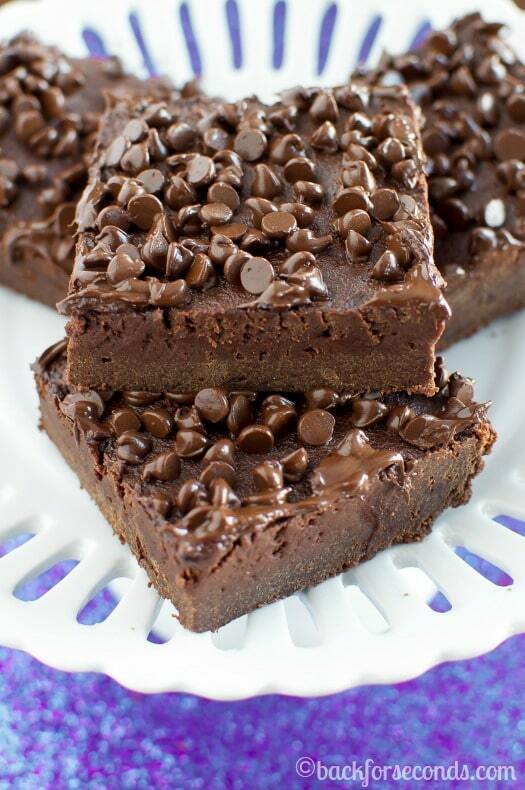 So fudgy and delicious. I was skeptical because of the lack of eggs or butter, but I was pleasantly surprised. I’m so thankful to have come across this recipe, finding eggless recipes can be challenging, especially brownies. Thank you!! About 8oz 🙂 Hope you all enjoy them! I just made these today and my husband loved them! I added walnuts for some crunch and they tasted awesome! 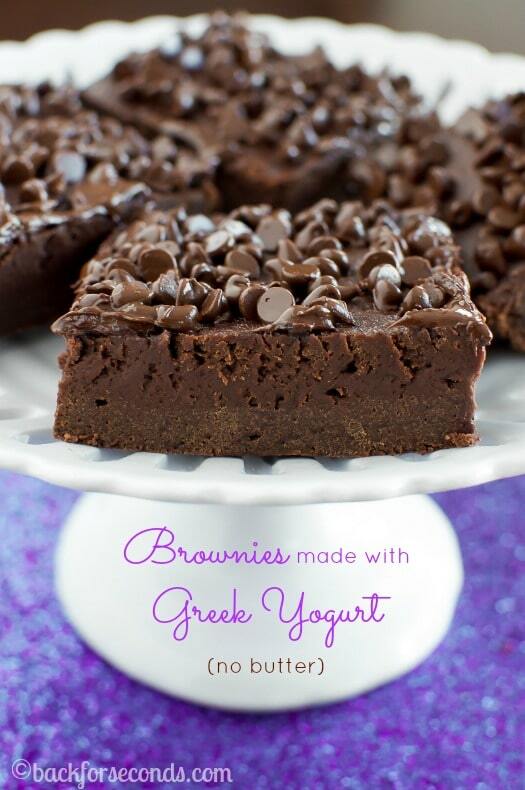 The fudge brownies Look very delicious also the style of making it by using Greek yogurt is very unique for me. Good work, I am very eager to try it, and thanks for sharing it.